KX Matrikx combination, TWO Carbon filters, PRE and POST to replace 2 packs such as GE FX12P. Two Filters are included. Matrikx 01-250-125-975 CTO PLUS 0.6 Micron Nominal Filtration (for VOCs reduction) and KX Matrikx 02-250-125-975 Carbon Block 2 micron nominal (5 micron absolute). This combo removes chlorine, taste , odor , turbidity, particulates, VOC, TOC, Chloroform. 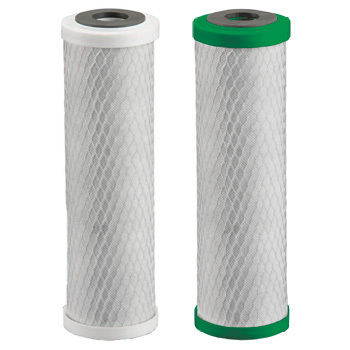 Filter 1: KX Matrikx CTO carbon filter part number 32-250-125-975 removes chlorine, taste and odor, and organic chemicals that contribute to bad taste and odor. Filter also provides a dirt holding capacity of a 5-micron sediment filter. Also used in filtering organic solvents. It is ideal for use in residential and commercial water purification systems, food service, and as pre- and post- filter in Reverse Osmosis systems. Filter 2: KX Matrikx CTO PLUS 0.6 micron carbon filter part number 01-250-125-975 to reduce VOCs and several other dangerous chemicals. Filter Size: 9.5" x 2 7/8"
Nominal Size: 10" x 2.5"
Rainsoft UF22T, UF22, UF20 as 21176, UF50, UF50T as 21179 and 21191. And many other filter housings that take a standard size 10"x2.5" cartridge. The KX MATRIKX CTO WATER FILTER is Tested and Certified by NSF International under NSF/ANSI Standard 42 for material requirements only.